I caught Cedric The Entertainer on TV3 last night. My first experience of these shows was the Tracey Ullman Show, in the late 80's and In Living Color in 1990. America still has Saturday Night Live, as a much loved weekly full spectrum entertainment variety show. Luckily it survived by evolving. So it comes as a surprise to see this very overdone show format on Television. 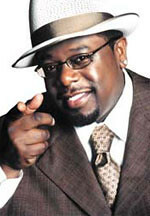 Cedric The Entertainer is not really that funny, in comparison to many other comedians. He has a good profile though - I first saw him in that Barbershop movie with Ice Cube a year or so back. I like him though. He's safe, slapstick and surprisingly real, in comparison to someone like say, Mika on Maori TV (eeek!). 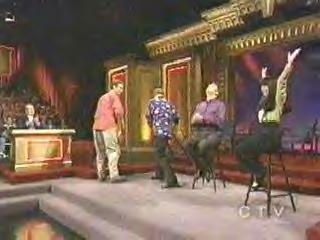 I noticed the set used for Cedric's show looks very much like the Whose Line Is It Anyway set. The opening camera flyover and the giant red drapes gave it away. Whose Line Trivia: Colin has done just about everything to get out of singing a proper hoedown/bartender/whatever. Past tricks have included fainting, having a heart attack, singing in German, walking out half-way through, stopping and smiling through the rest of the song, or shouting out "Instrumental!". I look forward to the 2005 series of What Now (returning March 6), produced by Whitebait TV (Jason Gunn). I liked What Now circa 1987 and 1998. I'd like to see more kids shows on TV - for example 'After School' is needed now more than ever to educate kids on the fast crazy world we live in, filled with dangerous situations and often unprecedented obstacles and stress. Jason Fa'afoi (sp?) would be the perfect host. Sticky TV over there at TV Works is on the right track, taking the crazy messy games of Noels House Party/What Now '98 out to our own Crinkleybottom streets and parks. Mums will like that bit.